I'm debating whether to get 19" or 20" wheels for my car. I'm afraid if I get 19" wheels the there would be a lot of gap and the tire would look too thick. Whoever has wheels on there car I'd appreciate if you would attach some pictures. PS Im not lowering my car for a couple of months. 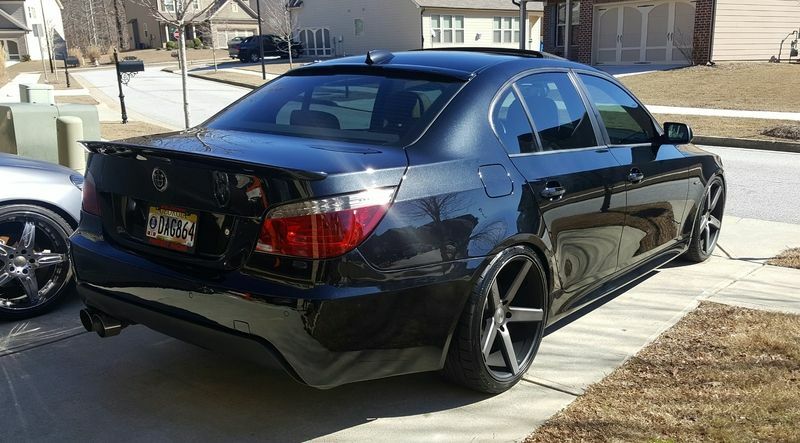 19" M5 wheels staggered. Not lowered. 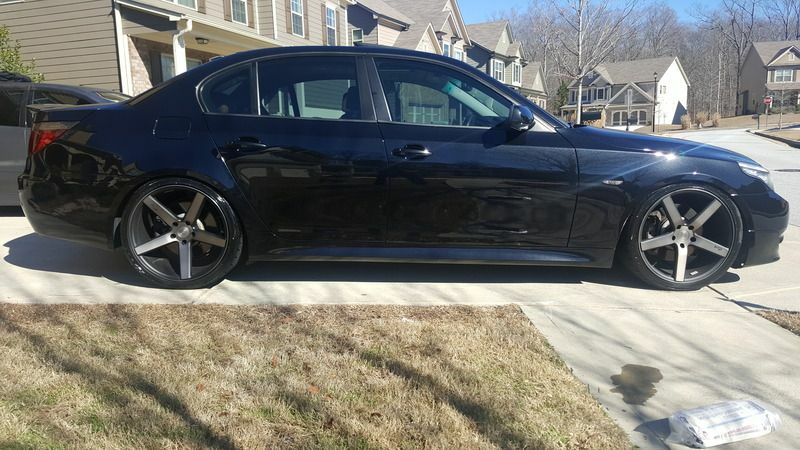 I have 19" BMW M3 GTS wheels... I currently run 19x9 on all 4 wheels. I didn't want staggered because I like being able to move the rears to the front once the tread starts to get lower. I have a 535i. The offset of the wheels is 35... I did have to use some spacers, I went with eibach wheel spacers, cost a little more, but its the peace of mind I paid for... I have hit 155mph many times, hit pot holes, blew out tires, never had an issue with the wheel spacers. Whether you go with 19" or 20", the wheel gap should be the same or very similar. They should both have the same overall tire diameter, just the 20" tire would have a smaller aspect ratio. if you get 20" wheels and use a significantly larger tire diameter than stock (significant = more than a coupe tenths of an inch), you're going to throw off your speedometer and possibly ABS, and make the car slower (like giving yourself taller gearing). If you're concerned about gap, you need to lower the car with springs/struts. and make the car slower (like giving yourself taller gearing). Car is going to be slower even with the same overall diameter. Wheels and tires are reciprocating weight. Larger wheels weigh more, unless they super expensive magnesium, or 3 piece forged. It takes more power to get them turning. Each pound of weight is like moving 10 pounds. Thats why a car will virtually always be slower with larger wheels (and why I speced 18s on my car instead of the optional 19s). I left that out b/c it's not universally true (per your caveat about mag/3 pc) and OP did not specify the wheels he was choosing - and he wasn't really asking about weight. But it's possible for the 19" or 20" wheels to be lighter overall than smaller stock wheels, and even though they are larger diameter and the weight is moved out further form the center of rotation, it could potentially be offset by having less rotating weight overall. I'm no ME so I digress. I think the best you could hope for with larger wheels is to break even on the reciprocating loss. You can get a set of staggered Forgestar F14s in concave and super concave rears for $1300-1400 shipped at Modbargains. They are lightweight and will improve sprung weight to rotation over stock 18s which weigh 25 and 28 lbs F/R. They are made on spec and you can order any offset to avoid spacers. I think weight is 20/22 in 18". Add a pound or two for 19. I prefer staggered 18s which are a good compromise for handling/ride quality. You can add coil overs or even a set of H&R sport springs to lower the car and eliminate the gap. Agree on Forgestar Deep Concave F14's - I may be getting those, actually! Also think the staggered 18's are a good setup, especially on a black car - that color makes wheels look bigger. This is in fact the reason I have never been in a hurry to upgrade my wheels from the factory sport pkg 124's. I was considering 8.5" concave F and 10" deep concave R in gun metal. The weight saving is equivalent to 30 WHP and they look awesome. The stock Style 124 are made by BBS but they are pretty heavy. I feel it first hand when rotating to winter tires and lifting them up high to fit in my garage storage rack high on the wall. It's like a technical squat and lift move, those things are heavy! My car is also black. inside out. Yeah, gunmetal is my first choice. But ... silver always looks sharp with black, and is a classic, less 'tuner' look - can't decide! What offsets do you plan? It IS amazing how the color of the car and other factors make the wheels look VERY different. I have two BMWs, a 2006 BLACK E46 Convertible with style-135 wheels (m-sport/technik) and my 2010 WHITE E60 with style-135 wheels. Both 18", same exact tires on the rear of the vert as on the entire 535i and the wheels on the convertible, to me, look smaller. But, the e46 is also dropped a little so the car sits over the rear tires somewhat, while the e60 still sits above the tire (for about another month!). I'm considering the F14 also. I like the silver look with a black car, its just a classy clean look. My m sport wagon is white so for me I think I would go with gunmetal but if it was any other color it would be silver for sure. I asked Forgestar for the weight on a few wheels, here's what they said. We only have weights on the 18 9.5 +35 offset 20.2lbs 18 10 +42 20.5 lbs. Looks like that would be for the semi concave and the deep concave. I wonder how much more the Super Deep concave would weigh in 18x10. I like the look of the 19"s better TBH, but the additional 2.5 lbs/wheel (front) and 4.5 lbs/wheel (rear - crazy, that's 22% weight increase from the 18's!) just isn't worth the marginally better look to me.